Australia has the world's worst record for mammal extinctions; 28 species and subspecies, mostly marsupials, have become extinct since Europeans arrived, and many of these extinctions are linked to cats and other introduced species. Cats are fabulous little predators. They've honed their skills over millions of years and, despite appearing beguilingly fluffy and adorable, they are swift and silent killers. The startling conclusion is that cats are the biggest human-linked cause of death for native animals in the US, with a bigger impact than habitat destruction, pesticides, pollution and collisions with cars - all regarded as more pressing conservation issues. Across the Tasman in New Zealand it is birds rather than mammals that have suffered, many of them flightless ground-dwellers. There's the lamentable story of the Stephens Island wren, one of only three flightless songbirds ever known. It was discovered by lighthouse keeper David Lyall in 1894, only to be hunted to extinction by his pet cat and a number of others shortly after. In total, the extinction of nine bird species and the perilous state of 33 others has been linked to cats - and this is in a country where 48 per cent of homes own them, the highest figure globally. In January, prominent NZ economist and philanthropist Gareth Morgan called on the public to do something to stop the damage. With his 'Cats to Go' campaign he proposes cats are phased out. Feral cats should be euthanased, he says, and people should consider not replacing pets when they die, or keeping them indoors. Many owners don't believe their lovable kitty is a killer, but a recent study from the University of Georgia, USA, which attached cameras to 60 pets, found almost half were active hunters. It also revealed them eating roadkill, lapping at sewer water and dodging cars - providing other good reasons to keep your cat safe at home. Removing cats simply won't work in Australia. The government says it isn't feasible to eradicate feral cats on the mainland, meaning that the best hope for some endangered species is that populations will be fostered on cat-free islands, or in fenced enclosures of the kind the AWC creates. It's a different story with pets, though. If you have a cat, there are easy steps you should take to minimise the impact on local wildlife. Keeping it in at night can reduce the kills it makes by half. Cats should also wear a collar with a bell, or, even better, a sonar beeper that produces high-pitched tones, which doesn't bother cats, but alerts birds to their presence. Neutering stops cats procreating and makes them less likely to roam and hunt. Of course the cats are blameless - they're just doing what their instincts tell them. Cat owners claim to be animal lovers and, if this is true, they need to step up for our native wildlife. We're proud of our stunning landscapes, but Australia has a shameful record when it comes to conservation. Most people wouldn't consider letting their dog run free in the neighbourhood, so why is it acceptable for cats? Perhaps it's time to make this cat your last or keep future cats indoors. Cats’ bad reputation among bird-lovers may be well deserved. 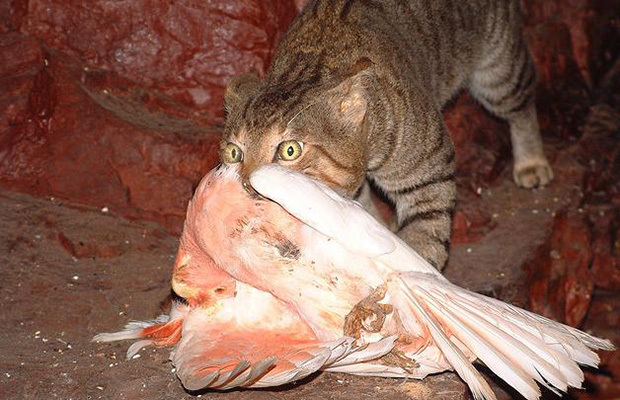 A new study estimates that domestic cats, considered a global invasive species, kill 1.4 to 3.7 billion birds in the lower 48 states each year. “Our findings suggest that free-ranging cats cause substantially greater wildlife mortality than previously thought and are likely the single greatest source of anthropogenic mortality for US birds and mammals,” write the authors of the study, published in Nature Communications. More birds die from cat encounters than from collisions with buildings, communication tower, or vehicles, or poisoning by pesticides. Two-thirds of the killers’ avian victims are native species. Cats also kill 6.9–20.7 billion mammals each year. City cats tend to eat non-native rats and mice, which most view as a nuisance anyway. But country cats predominately kill native shrew, vole, squirrel, mouse, and rabbit species. The authors of the paper reviewed 21 studies, which they used to estimate cat population and predation rates. The paper is part of a larger effort to quantify all human-related causes for wildlife mortality. Previously, scientists knew that domestic cats had devastated native species on islands and contributed to 33 modern extinctions. But it had been unclear just how dangerous they are on the mainland. The most voracious killers are cats without owners—such as barn cats or feral cats living in cities. We therefore might get our biggest improvement in bird mortality changing our management of feral cats, the paper’s authors suggest. Currently, many feral cats are managed in “Trap-Neuter-Return” colonies. The policy does keep cat populations from growing and avoids mass cat euthanasia, but the paper say it is “potentially harmful to wildlife." Pete Marra, an author of the paper and a scientist at the Smithsonian Migratory Bird Center, suggested to Science News that cat owners might want to have their cats spend more time indoors. The authors say that much more research is needed to pinpoint the areas and times of year when native birds and mammals are in the greatest danger from cats, and to establish which species need the greatest protection.